Perovskite materials have become very promising candidates for a new generation of potentially printable and efficient optoelectronic devices. As of 2018, progress has been made in improving the stability and scalability of perovskite-based single-junction and tandem solar cells, thanks to better mastering of synthesis methods and optimization of device architectures. Exploration of the detection properties well beyond the visible spectrum continues, as well as the use as emitters. 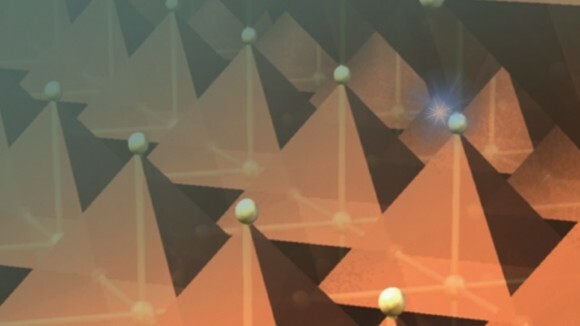 Open questions remain on the optoelectronic processes taking place in metal halide perovskites, triggering further investigation of the physics of these materials. This web-collection brings together an editorially-curated selection of multi-disciplinary research articles published in the Nature journals that explore the basic properties of halide-based perovskite materials and their potential for application in optoelectronics, from solar cells to lasers. In addition to Research Articles, the collection gathers Comments and selected News and Views published since January 2015 in the News and comments section and Perspectives and Review articles under Reviews. Historical milestones on the synthesis and characterization of hybrid organic-inorganic metal halide perovskites and their use in applications are reported in the Milestones section. This collection was initially published online in September 2016, and was updated in September 2017 and September 2018. Perovskites, with their wide bandgap range, are good partners for both commercial and novel photovoltaic technologies in multijunction solar cells. Here, McGehee and co-workers review recent material and device developments and highlight future challenges and opportunities for perovskite-based tandems. The photovoltaic reliability community is well-established and links researchers from academia and the industry. Here, Snaith and Hacke draw lessons from the development of international reliability standards for commercial technologies to inform future work on perovskite solar cells and modules. Perovskite solar cells (PSCs) have emerged as a revolutionary class of photovoltaic technology. Here, we review recent progress and challenges in scaling up PSCs towards commercialization. We discuss several areas, including device architectures, deposition methods, scalable deposition of perovskite and charge transport layers, device stability, module-level characterization and techno-economic analyses. Lead-halide perovskites have entered the family of colloidal nanocrystals, showing excellent optical properties and easy synthesizability. This Review provides an insight into their chemical versatility, stability challenges and use in optoelectronics. The tunable bandgap of perovskites and their combination in multi-junction solar cells can afford highly efficient photovoltaic technologies. This Review reports the latest developments in tandem multi-junction perovskite solar cells and discusses prospects for this technology to achieve energy conversion efficiencies well beyond those attained by silicon-based cells. This Review summarizes advances in understanding the unique physical properties of hybrid perovskites that enable the fabrication of high-efficiency solar cells with high open-circuit voltages, which is crucial for their further development towards commercialization. Hybrid organic–inorganic perovskites (HOIPs) comprise a diverse range of chemical compositions from halides and azides to formates, dicyanamides, cyanides and dicyanometallates. In this Review, advances in the synthesis, structures and properties of all HOIP subclasses are summarized and their future opportunities are discussed. Conventional photodetectors, made of crystalline inorganic semiconductors, are limited in terms of the compactness and sensitivity they can reach. Photodetectors based on solution-processed semiconductors combine ease of processing, tailorable optoelectronic properties and good performance, and thus hold potential for next-generation light sensing. Understanding of defect physics in perovskite-halide semiconductors is essential to control the effects of structural and chemical defects on the performance of perovskite solar cells. Petrozza and Ball review the current knowledge of defects in these materials. Perovskite solar cells have emerged as a potential low-cost alternative to existing technologies. In this Perspective, Park et al. explore a strategy for the commercialisation of perovskite solar cells. Organometal halide perovskites have drawn remarkable attention in photovoltaic applications due to their optoelectronic properties. In this Perspective, the authors outline the potential of these materials in a variety of energy-related applications. The prospects for light-emitting diodes and lasers based on perovskite materials are reviewed. The charge transport properties of hybrid organic—inorganic perovskites, which can explain their excellent photovoltaic performance, are reviewed through an integrated summary of experimental and theoretical findings. The potential origins of these properties are discussed and future research directions are indicated. This Review discusses recent developments in photovoltaic and light-emitting optoelectronic devices made from metal-halide perovskite materials.